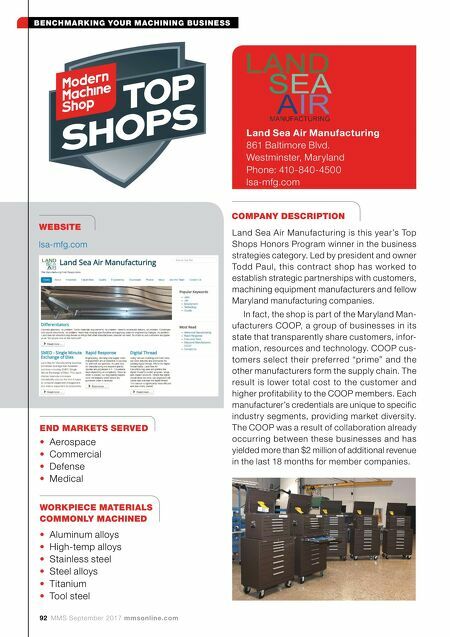 BENCHMARKING YOUR MACHINING BUSINESS mmsonline.com MMS September 2017 93 Carl Livesay, Land Sea Air Manufacturing's vice president of operations, shows Maryland Governor Larry Hogan (right) the fully stocked toolboxes the shop recently gave to each manufacturing team member. The toolboxes are identically configured with tools from MSC and represent an invest- ment $8,250 per team member. 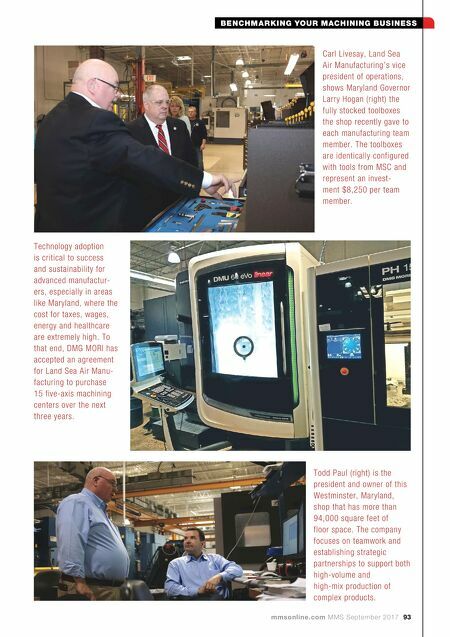 Technology adoption is critical to success and sustainability for advanced manufactur- ers, especially in areas like Maryland, where the cost for taxes, wages, energy and healthcare are extremely high. To that end, DMG MORI has accepted an agreement for Land Sea Air Manu- facturing to purchase 15 five-axis machining centers over the next three years. Todd Paul (right) is the president and owner of this Westminster, Maryland, shop that has more than 94,000 square feet of floor space. The company focuses on teamwork and establishing strategic partnerships to support both high-volume and high-mix production of complex products.